In the early 1990s I judged a working test for the Curly-coated Retriever and I don't think I have carried out this task for a more charming bunch of people and such a likeable selection of dogs. The dogs were very much tyros and their handlers not experienced, but were modest enough to realise this. The dogs impressed me, not for their retrieving skills as much as for their character and enthusiasm. The owners were sporting in their approach to the day; the dogs eager but not frenetic. If I were going to purchase a retriever it would be a Curly, much as I admire the highly proficient Labrador, the fussless Chesapeake, the handsome Golden and the approvable Flat-coat. The lack of popularity of the Curly-coated Retriever baffles me but it has protected the breed from both over- and unskilled-breeding. In 1908, 163 Curlies were registered with the KC; in that year, 123 Labradors were registered. In 1999, 90 Curlies were registered and 33,398 Labradors, a simply astounding change in fortune for the latter. The Labrador's popularity has been richly deserved. These figures do show however that the Curly is under-appreciated. When expressing my admiration for the Curly and I hope promoting a revival in its popularity, I am in no way decrying the other retriever breeds. I have long been an enormous fan of retrievers; as a group of dogs they give widespread service to man and rarely have vices. As breeds they are relatively young, but their origins are ancient. The Curly-coated Retriever is a water-dog, a dog which had great value all over Europe in medieval times. Before the invention of firearms, water-dogs retrieved bolts, arrows and otter spears from rivers and lakes, as well as wildfowl. Many survive as contemporary breeds like the Wetterhoun in Holland, the Lagotto Romagnolo in Italy, the Barbet and the Poodle from France, the Cao d'Agua of Portugal, the Spanish Water Dog, the Irish Water Spaniel and the American Water Spaniel. These breeds share a common coat colour and texture. A Standard Poodle with an all-over clip is remarkably like a Curly. Water-dog blood is behind the retriever breeds, as the ancestry in the Golden of the Tweed Water Spaniel indicates. A number of knowledgeable writers of times past have become seriously confused by the Curly. Youatt scarcely mentions the breed. The much-quoted Stonehenge wrote that: "Little or nothing seems to be known of the history of this dog...there is no getting at the exact source of the breed...I am led to think that some non-sporting dog, such as the poodle has been used...The general belief is that the water spaniel and small Newfoundland have been used in establishing the breed, and there is little doubt of the truth of this theory." This is quite astonishing ignorance for a writer of his standing. Dalziel, usually so reliable, attributes the curly-coat to the "old close-curled English Water Spaniel" and states that many think the Irish Water Spaniel is behind the breed. Rawdon Lee did the breed no favours, writing in 1906, that: "He is inclined to be hard-mouthed...His temper too is decidedly unreliable, especially with strangers..." Lee was a prolific writer and more of a gossip than a real dogman. At this time the Labrador was being promoted strongly and rival retrievers played down. I don't know of any evidence of a breed being hard-mouthed, i.e. damaging the shot game being carried in the dog's mouth. I have never come across a whole breed possessing an unreliable temper; I like my dogs to be suspicious of strangers. The Curly is the best guard dog of the gundog breeds and grows out of puppyhood rather better than some retrievers. Even Rawdon Lee felt compelled to record that: "We must however look to the curly-coated retrievers as the hardiest of their race, and perhaps the best animals to use as assistants for wildfowl shooting...He is a faithful and useful dog to follow the keeper who makes a companion of him, for, in addition to being very steady and easy to command, he possesses a good nose if the scent be not too stale..." Idstone, himself a great promoter of the Labrador, wrote of one Curly: "I don't know any dog which I coveted more, or which has produced better offspring." The breed standard of the 1890s gave the general appearance of the breed as: A strong, smart dog, moderately low on leg, active, lively, beaming with intelligence and expression. Rawdon Lee was happy to publish these words. 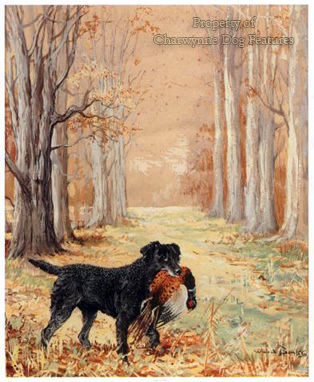 James Wentworth Day, who expected a great deal from his retrievers, being a renowned wildfowler, had enormous regard for the Curly. In his compelling The Dog in Sport (Harrap, 1938), a superb read for any youngster starting out in dogs, he wrote: "Then there was Bruno, the curly-coat...He was a good-looker from nose to tail. He stood well and moved well. He would face any tide and sniffed at the cold. I remember sitting for three and a half hours one winter afternoon in a sunken barrel by the side of the fleet on a marsh at Salcott, snow falling and a north-easterly half a gale blowing. Bruno scarcely moved the whole time, and never whimpered." It is that fussless stoicism and supportive loyalty that makes a Curly the retriever breed for me. I warmed to the breed too when Wentworth Day described how when he shamefully shot a moorhen, Bruno swam out and retrieved it, placed it at his owner's feet -- then pointedly raised his leg and urinated over it, showing his contempt. I doubt if his owner transgressed again! In his classic Dog Breaking of 1909, General W N Hutchinson relates how one sportsman: "...had a famous retriever whose build, close curly hair, and aquatic propensities showed his close affinity to the water spaniel...He retrieved with singular zeal and pertinacity. Indeed his superiority over all competitors in his neighbourhood was so generally admitted that his master was hardly ever asked to shoot at any place without a special invitation being sent to "Ben"." The unique astrakhan coat of the Curly, like the coats of the Vizsla, the Weimaraner and the Dalmatian, provides an inbuilt protection against cross-breeding; if the astrakhan coat isn't there neither is the breed! This distinction is reinforced by the fact that this is the tallest retriever with a silhouette all his own. Bede Maxwell, in her very forthright The Truth About Sporting Dogs of 1972, wrote on the Curly that: "He is a sober customer in the main, sometimes dour, and with a mind of his own, but a magnificent dog to own...He should not (maybe could not) look like a Labrador in outline, nor a Golden, nor a Flat-Coated. He is all his own dog!" Against these compliments can be placed the words of "Pathfinder" and Hugh Dalziel in their Breaking and Training Dogs of 1906: "I do not like Curlies of any colour. As far as my experience goes, the more the coat curls the more bounce and impetuosity in the dog and the harder his mouth." The author's experience with the breed is not revealed but his comments on coat texture are clearly absurd and if curly-coated dogs are harder mouthed than others, medieval sportsmen would have noticed it and it would have been recorded and acted upon. It is therefore worth setting out the references we do have of curly-coated water-dogs in medieval times. In the ancient world anyone found guilty of killing a water-dog was subject to a most severe penalty. The first written account of a Portuguese Water-dog is a monk's description in 1297 of a dying sailor being brought out of the sea by a dog with a black coat of rough long hair, cut to the first rib and with a tuft on the tip of the tail, the classic water-dog clip. Water-dogs came in two types of coat: long and harsh-haired or short and curly-haired. The French Barbet displays the former, the Wetterhoun of Holland and our Curly the latter; the Portuguese Cao d'Agua or water-dog features both. In The Sketch Book of Jean de Tournes, published in France in 1556, the great rough water-dog is depicted, a big shaggy-headed dog swimming out to retrieve a duck from a lake. In Dr Caius's Of English Dogs of 1576, he described the Aquaticus, a dog for the duck, but blurs the water-dog with the spaniel. He does however in 1569 provide his naturalist friend Gesner with an illustration of a Scottish Water Dog, retriever-like but with pendant ears. Writing in 1621, Gervase Markham recorded: "First, for the colour of the Water Dogge, all be it some which are curious in all things will ascribe more excellency to one colour than to another as the blacks to be the best and the hardier; the lyver hues swiftest in swimming...and his hairs in generall would be long and curled..." In 1591, Erasmus of Valvasone wrote a poem on hunting, which will appeal to Lagotto fanciers, referring to "...a rough and curly-haired breed that does not fear sun, ice, water...its head and hair resemble that of the ram, and it brings the bird back to the hunter merrily." Despite the long history of the water-dogs, we in England have lost both our English Water Spaniel and our Tweed Water Spaniel. We have failed to acknowledge the ancient origins of our Curly mainly through the ignorance of Victorian dog writers, who so often speculated about an origin for the breed involving crosses between the Newfoundland and the Setter. The much-quoted Stonehenge, writing in 1877, described Lloyd-Price's retriever Devil as "a curly liver-coloured dog, apparently a cross between the Irish Water Spaniel and the Poodle...showing great perseverance in hunting, with a good nose." 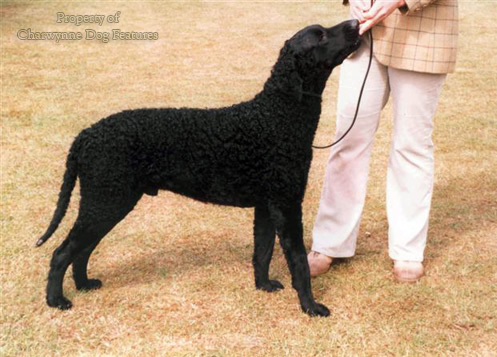 The Curly-coated Retriever shares a common ancestry with these two breeds but as a type is as old as either. The revised breed standard for the Curly, under General Appearance, gives a description of: "Strong, upstanding dog with a degree of elegance. Distinctive coat." The general appearance in any standard should tell you what the dog looks like. This general appearance wording could refer to a Dalmatian. Breed standards must surely be written to a format so the general public can visualise what the breed should be. It would be a major step forward if the Kennel Club were to stop drafting breed standards by way of a committee and hand the task over to a professor of English! This particular breed standard, under 'Movement', demands: "Parallel movement. At speed, legs tend to converge". The word 'converge' means 'tend to meet in a point; come together as if to meet or join'. How on earth can any breed function with such foolish requirements? This breed has medium size ears: the standard demands rather small ears. The standard calls for large eyes but the breed displays quite small eyes. Ears and eyes can typify a breed; the standard should establish breed type. The American Kennel Club standard for the breed is just as misleading on these two aspects but is quite excellent on gait and temperament. A breed standard may not be a blueprint in the true sense of that word, but it should still act as the construction plan for a breed. The KC breed standard does no justice at all to this distinguished breed and needs a radical rewrite -- despite its recent review. But whether undersold in its breed standard or underused by today's sportsmen, this is a breed we should be proud of; it is our contribution to the water-dogs of the world. LPC Astley, writing in 1907, likened the Curly's coat to the close fitting tightly-curled beautiful head of hair of many native African people, stating that this was the only 'true and proper one...of which every knot is solid and inseparable. A coat of this quality is not capable of improvement by any methods of grooming, for the simple reason that its natural condition is itself perfect.' If you don't lust after the labour of grooming, this is the breed for you! Whilst I would not wish too much popularity on any breed, this one deserves wider patronage. Whilst we are welcoming new breeds of gundog here in each decade, this native breed of gundog goes underrated and largely unappreciated. It was gratifying to see, at the World Dog show in Helsinki, that our water dog was there in greater numbers than any other. The American standard describes the breed as: "Self-confident, steadfast and proud, this active, intelligent dog is a charming and gentle family companion and a determined, durable hunter. The Curly is alert, biddable and responsive to family and friends, whether at home or in the field. Of independent nature and discerning intelligence..." Perhaps this distinctive breed of ours is better appreciated abroad. If so that's not unique in a British product and shame on us for it.